An important milestone in the history of the Volk’s Railway was celebrated today. Founded by Magnus Volk in 1883, the railway celebrates its 130th birthday this year. To mark this auspicious occasion, the manager of Volk’s Railway, Stuart Strong, himself celebrating 20 years in the job, welcomed an invited group which included the Mayor of Brighton and Hove, Councillor Denise Cobb, Councillor Geoffrey Bowden, Simon Kirby MP, Councillors Geoffrey and Carol Theobald, and a host of volunteers for a birthday celebration. One hundred and thirty years ago, who might have imagined that Magnus Volk’s creation would end up being the oldest operating electric railway anywhere in the world? 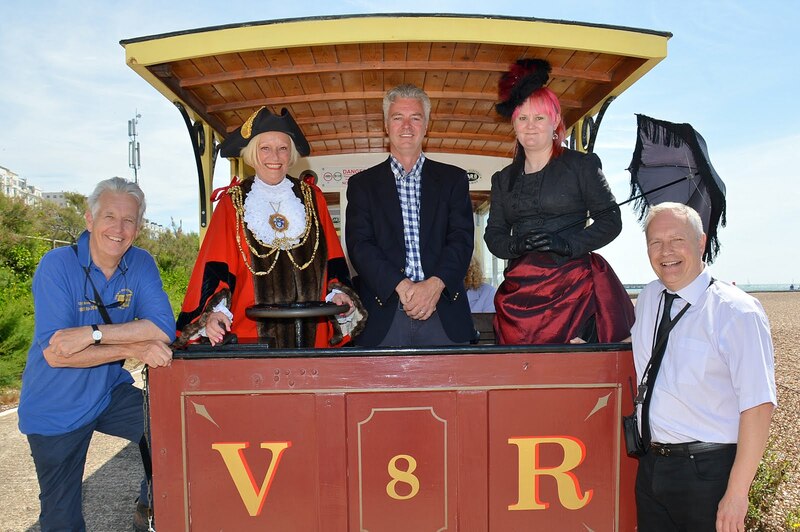 BBC newsreader Nicholas Owen, one of Volk’s Railway’s regular volunteers said, “It is impossible to imagine Brighton without Volk’s Railway. Every year, so many visitors, young and old, climb aboard and experience the delight of trundling majestically between what we at Volk’s still call Aquarium station – so convenient for the Pier and the Sea Life Centre – and Black Rock, just over a mile away next door to the Marina. I pay tribute to the small number of full-time staff, led by general manager Stuart Strong, who works so hard to keep the very old trains going. They are helped by an enthusiastic and very effective band of volunteers. Speaking personally, I also want to thank Brighton and Hove City Council for its continued support of what is a priceless part of Britain’s engineering heritage”.